CHANGE YOUR BRAIN - THEN YOUR BODY! Learn how your Stride Sticks are used to increase your stride and mobility for running and walking. Take your running and walking to the next level. Learn why a set of Stride Sticks may be the perfect addition to your personal fitness toolkit. COMING SOON! New videoes on using stride sticks for safety and muscle releases. Stride Sticks can help unload the hip, knees, ankles, and foot joints to help make your walking and running easier. By reducing pressure on the joints, they may help to increase your stride, distance covered and improve your quality of life. By using Stride Sticks you reduce the risk of the 5 most common walking and running injuries: plantar fascitis, achilles tendonitis, shin splints, knee pain (patella femoral syndrome), and IT Band Syndrome. What makes Stride Sticks unique? See why this patent pending system and device will change the way we look at walking and running. Stride Sticks are super light to reduce fatigue and help you focus on form. Our goal is the least amount of weight possible. See the video "Length versus Weight" and learn why we are the authority in sensorimotor changes in the body. Stride Sticks are custom fit to your body frame. Once you purchase the set we teach you how to customize the fit and get the most out of your running and walking. Choose from a variety of colors to fit your personal style and mood. Stride Sticks have reflective tape to help you be seen when exercising at night. In an emergency situation, Stride Sticks can be used as a last resort deterrent. They come with a LIFETIME warranty and almost unbreakable. If you are in an emergency situation, please call 911. 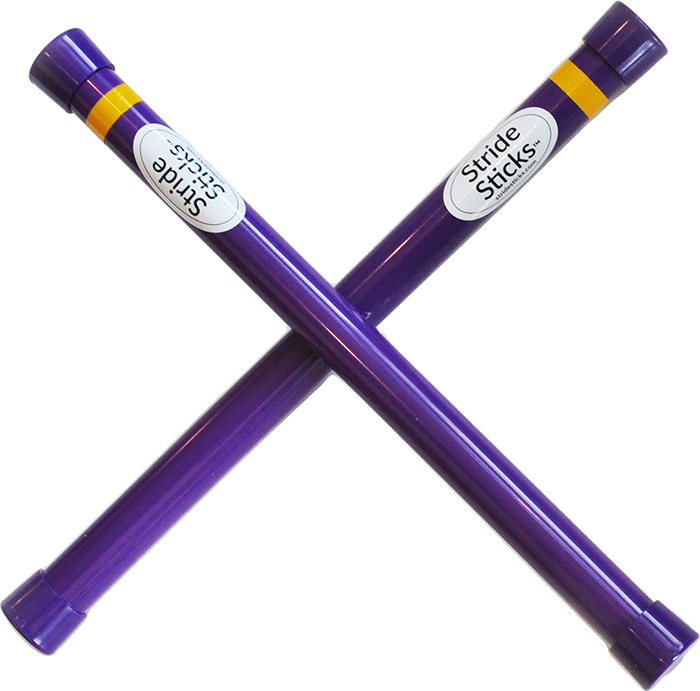 Stride Sticks can help you feel more confident and focused because they are just plain fun to walk, run, or hike with. Once you start using them you will never leave home without them. Join our mailing list to learn more about Stride Sticks and the world of mobility enhancements.